Preparations are far advanced for UK-based Ghanaian gospel musician, Joshey to launch his maiden album. The album titled ‘River Jordan’ is scheduled to be launched on September 1, 2018. Sangam Hall 210 Burnt Oak Broadway HA8 OAP will be the venue for attraction—as gospel music lovers in the United Kingdom (UK) gears up to honour the upcoming album launch being put together by Joshey Music. Joshey’s ‘River Jordan’ album consists of eight (8) tracks. 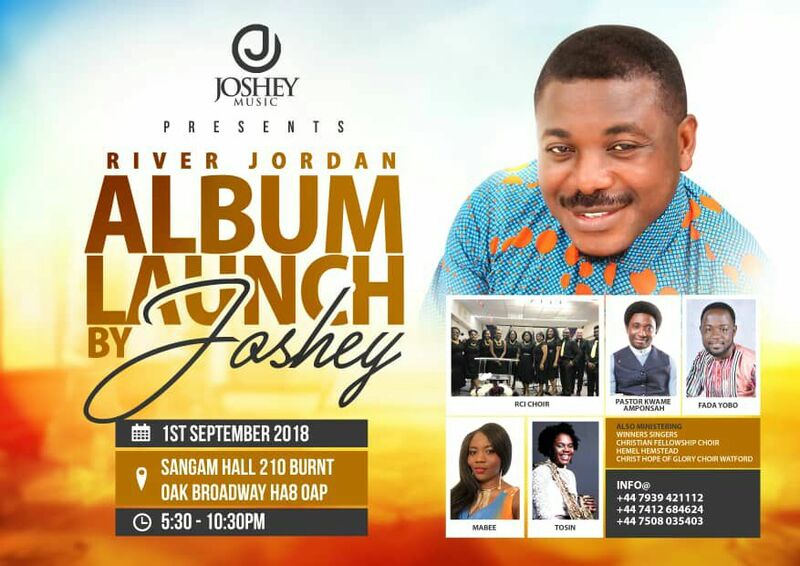 Pastor Kwame Amponsah, Fada Yobo, RCI Choir, Mabee, Tosin, Winners Singers, Christian Fellowship Choir, Hemel Hemstead, Christ Hope of Glory Choir Watford and a host of others will be performing at the ‘River Jordan’ album launch. In a chit-chat with the News Hunter Magazine, Joshey was hopeful that the event will be a great success. He stressed that God will richly bless the patrons of this event—because He has a purpose of assigning him to propagate His message through music to the world. Joshey, who has been in the ministry for about 30 years, disclosed that he takes a lot of inspirations from the Legendary Joseph Hill (Culture). He believes venturing into music was a plan made by the Almighty God—so he spends more time thinking about lyrics that will bring joy, happiness and make people experience God’s Glory, and His Greatness.